Marina boat slips and RV spaces are set up in the same way as hotel rooms with a few notable exceptions. This document will walk you through the settings unique to marina and RV park configurations. These settings will allow you to post meter readings and will allow you to charge a per-foot rate. 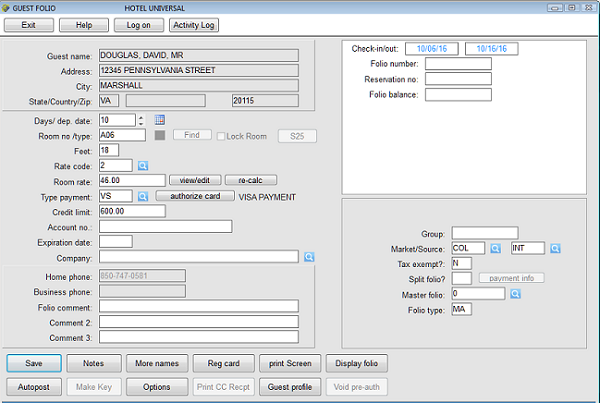 General setup instructions are in the Hotel Control Files Setup. Most of the information on this page refers to marina/dockage but the same instructions apply to RV and campsite spaces. Two fields in the parameter record should be set when configuration Execu/Suite for marina or RV Park. "Default room rate code (1-5,W,M,P)" can be set to P for the default if you wish to apply package rates. Otherwise enter the default rate code such as 2. If you use Execu/Suite for both lodging and dockage, this will apply to all. However, you can specify per reservation. For more information see Room Types and Guest Packages. "Site specialty code (optional)" must be set to M to use the marina features. This will not affect your guest room reservations or rentals. Marina slips and RV spaces must have a "room type". General instructions are in Room Type Setup . Dockage rates: To set up dockage rates using footage, enter the base rate in the "Single person" and "Multiple persons" fields. Then enter the additional per-foot rate in the "Extra persons" field. Just as a guest room charges minimum rate and then charges extra person rates for each person over the "base" rate, a slip will charge the base rate plus the extra feet rate. To set the footage over which to charge the extra footage rate, enter that number in the "Room rate 'Multiple persons' number" field. For example, if your minimum for this slip type is 10 feet, you will enter 10 in this field. Then the "extra" rate will apply to every foot greater than 10. 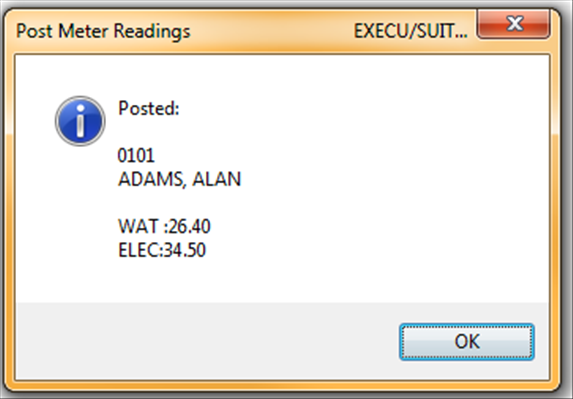 The "Central Res'v Code" must be set to U to activate the meter reading functionality. 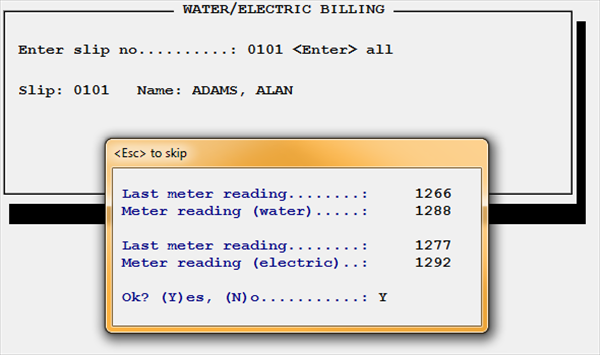 If you do not need to enter system-calculated meter readings you may leave this field blank. Each slip or space must have a Room number. Below are instructions to fields unique to Marina and RV properties. The marina slips and RV spaces are set up as described in the Rooms setup with the following exceptions. "Room number" is the slip or space number. If you sharing the database between your hotel rooms and the slips or spaces, it is a good idea to make the first character of the room number unique. For example, hotel rooms might begin with 1 such as 1100; marina slips might begin with S such as S100. 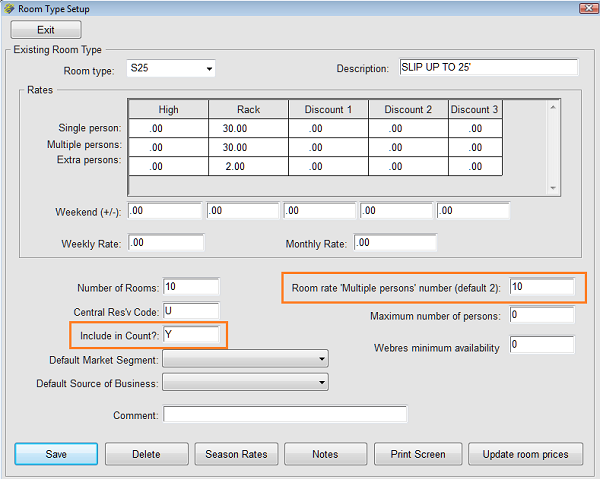 Note that if your parameter record is set to display rooms in Hotel style, they will display in alpha order followed by numeric order. For example, 0210 will display before 105 which will display before M101. "Include in Count?" must be set to U to activate the meter reading functionality. If you do not need to system calculated post meter readings you may leave this field blank. However, leave this field blank until after you have completed the setup. Then you will go back into the room and enter this information. "Optional Revenue Charge Code" may be used if you sell hotel-type rooms as well as boat slips and/or RV spaces and would like the revenue posted and subtotaled separately. 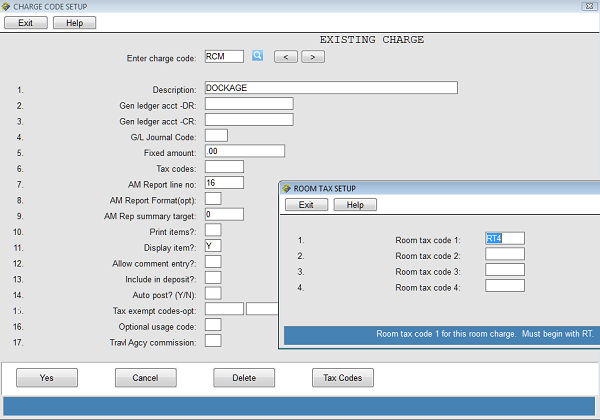 You also will use this if different taxes apply for slips and spaces than for rooms. The code MUST begin with RC such as RCM or RCRV or RC1. Answer Y if you want to enter meter readings. Enter the charge code for Water and Electricity readings. You will not change this information again unless you reset your meters. 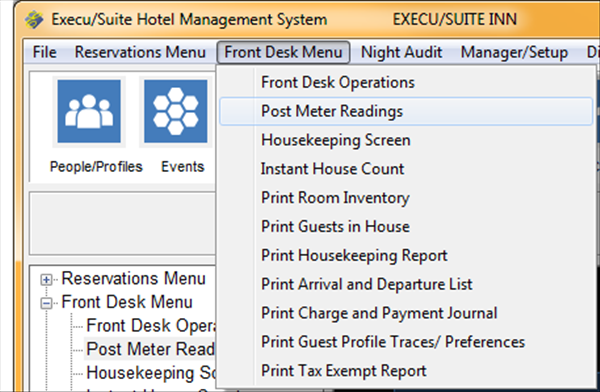 As guests check out and you enter ending meter readings the system will update automatically. Several optional charge codes should be set up. General setup instructions are in Charge Codes setup. Codes specific to Marina or RV properties are discussed below. RC or RC* (where * = another character such as M): This code is for is the nightly charge for dockage/ slip or space rental based on vessel footage. This code must begin with RC. RT or RT* (where * = another character such as M): This code is for the taxes or fees that should apply to and post for RC* charges. BASE: If you are using packages, you can use this code for your base rate regardless of footage. This code may be any alphanumeric characters as long as it is not a code used elsewhere as a charge code or a payment code. if you are not using packages, you do not need this code. WAT: This is the code that the system will use to post water usage based on the meter readings you enter. This code may be any alphanumeric characters as long as it is not a code used elsewhere as a charge code or a payment code. In the "Fixed amount" field enter the rate per unit that the system should calculate when you post meter reading charges to the guest's folio. ELEC: This is the code that the system will use to post electricity usage based on the meter readings you enter. This code may be any alphanumeric characters as long as it is not a code used elsewhere as a charge code or a payment code. In the "Fixed amount" field enter the rate per unit that the system should calculate when you post meter reading charges to the guest's folio. Other guest charges must also have charge codes. General charge code instructions are in Charge code setup . Marina and RV properties may use Guest Packages. You may have as many packages as you wish. However, we suggest creating as few as possible in order to simplify the selection process when making a reservation or checking in a guest. If the "room" is set up as a marina slip or RV space as described in this document, then the RC* charge (such as RCM shown above) will post per foot. Taxes (RT, RT2, etc.) can be assigned a specific dollar amount or they can be set to calculate. To set them to calculate, enter C in the AMOUNT column. Make sure to assign P as the rate code when reserving or checking into a slip or space. See also Guest Packages . To be able to look up a guest folio by boat name, go to POS Administrator - Store Record - Hotel - Hotel Specialty Code - B. The slip name must be in Comment 2 of the guest's folio. Other settings, if any, will be discussed by your Execu/Tech trainer. Reservations for for boat slips and RV spaces are made the same was as guest rooms. Marina and RV specific instructions are below. See Reservations for general instructions. When you have entered the room number, the adult/children fields will go away and the "Feet" field will appear. Enter the feet of the vessel or vehicle. This will allow the rate to charge per foot. When you get to the Rate Code field, make sure to enter P. Press Enter. This will bring up the Package selection screen. Enter the package code or click the magnifying-glass lookup icon to look up the package code. The package details will display. Select the package code and press Enter> until the "Length (feet) prompt displays. Enter the number of feet and press Enter. When you get to the Rate Code field, make sure to enter P. Press Enter. This will bring up the Package selection screen. Enter the package code or click the magnifying-glass lookup icon to look up the package code. The package details will display. Select the package code and press Enter> until the "Length (feet) prompt displays. Enter the number of feet and press Enter. 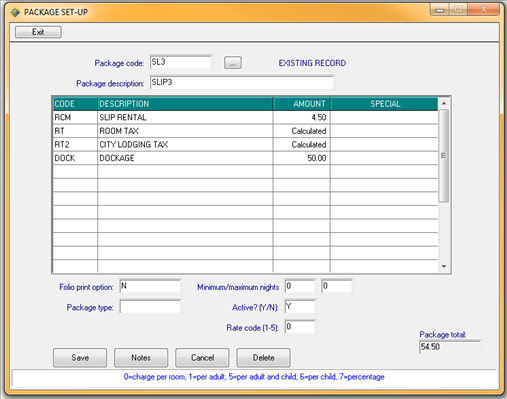 The image below shows a reservation using a package (Rate code) P.
The reservation process is similar for a non-package slip rental. Instead of P as the payment code you will put the appropriate code 1-5. The default as defined in your Parameter Record will display. As soon as you enter the room number (if it is set up as a slip) and press Enter, the "adults/children" fields will be replaced with "feet". 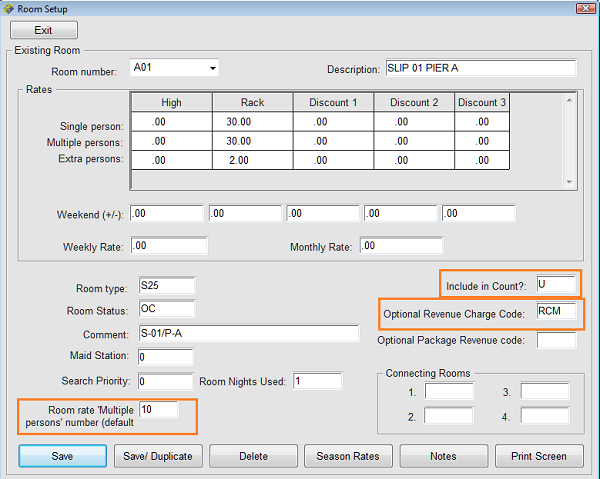 When you enter the number of feet and press Enter, the system will calculate the nightly rate based on the setup for this slip or type. In the example below, the base rate for this slip is $30 for a ten-foot minimum. Each foot over 10 is $2 per night. The nightly rate for this 15-foot slip is therefore $40. Tax will be calculated separately and will display in the "total room and tax" display for the stay. Check-in will be the same as for a guest room except as shown below. See Check In for general instructions. 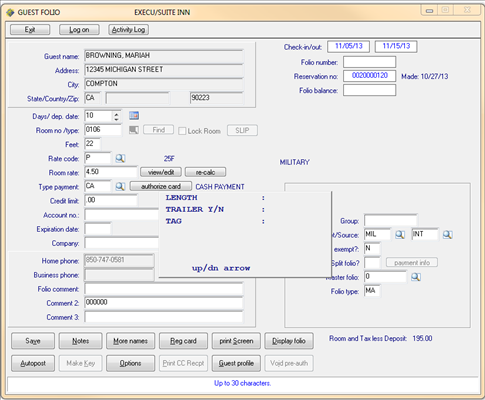 The image below shows a check-in for Slip A06. When the room number was entered, the "Adults/children" fields disappeared, replaced with "Feet". When the number of feet is entered, the system calculates the nightly rate based on the footage as well as the rate code (1-5) and the rate set up for that slip. If a rate code P is entered, you will see a prompt for the Package Code. If you have set up Comment 2 or Comment 3 as user-defined fields, these will popup at check-in when the user is in the Comment 2 or Comment 3 field. In the example below, the user is prompted for LENGTH (numeric field), TRAILER Y/N (alpha field) and TAG (alphanumeric). If User Defined Comments are setup, a popup will allow you to enter the specified information. See User Defined Comments. Initial meter readings are set up by you when you set up the "rooms", or when you reset them through "rooms" following the instructions in this document. When guests check in, the meter will set at the last reading. You will use "Post Meter Readings" to post current readings. This may be daily or at check-out. You may post for an individual guest or for all guests. 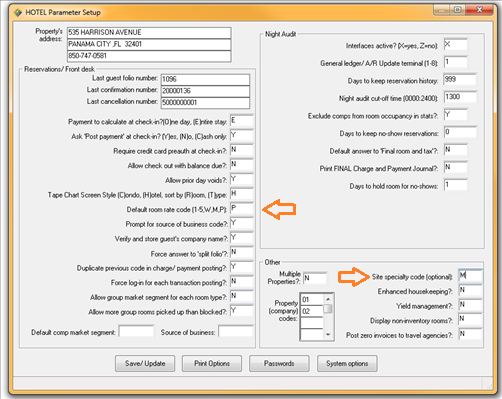 If set up correctly, the system will calculate the amount to post to the folio and will post the charges. Posting to a vessel rather than a guest room is done the same way as posting to a room. 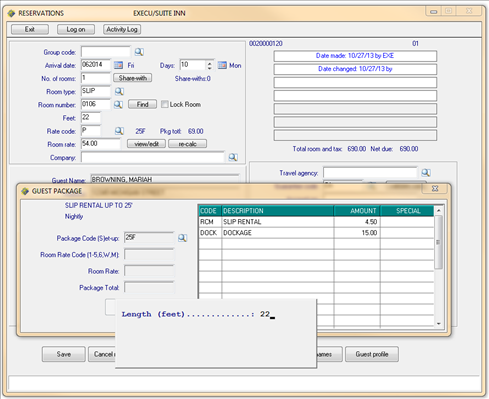 In the POS Total screen, select ROOM CHARGE and then enter the slip number. If you do not know the slip number, you can look up by guest name or by boat name. See Other Settings for instructions on enabling this option.